We were seniors in high school. We were in fast paced Calculus – which meant we had to finish the whole year of math curriculum in April, because we knew the big test would be in May. So we worked hard. We studied. We did homework. And in early May, we took the Calculus AP exam. I had no idea if I did well or screwed up. But honestly, I didn’t care. I was done. And as seniors, it meant we were almost done with school. There was one other reason I didn’t really care. My friend Robert was taking me to the Indy 500. I had never even watched a car race – ever. And here I was, headed to one of the biggest races out there. And guess what? I loved it. I loved every part of it. A lot has changed in 25 years. And yet, I can’t forget the generosity of a friend (and his family) who didn’t care that I brought nothing to the table (in terms of finances) to help with the cost of the trip. My friend paid for my airfare. They paid for my hotel. They bought my ticket to the race. They paid for all my food. And they accepted nothing in return. Do you have friends like that? They make you uncomfortable, don’t they? But my friend Robert and his family were generous even when I was uncomfortable. And I enjoyed an experience I never would have without them. 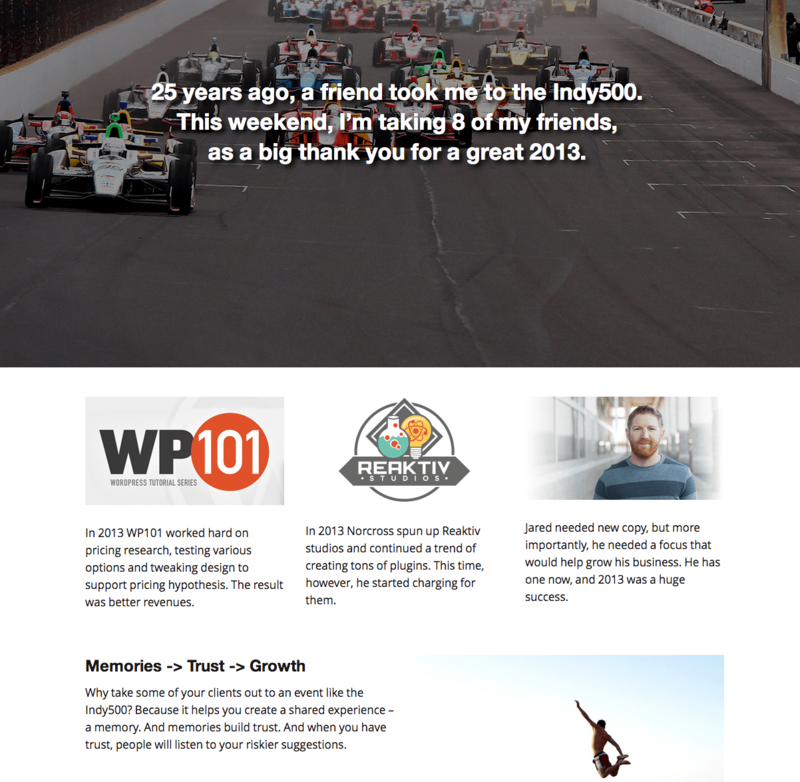 Now, 25 years later, I’m headed to the Indy 500 again. Only this time I’m the one being generous (with a huge hat tip to the Chartons) – taking a few friends with me as a thank you for a great 2013, a year where I got to help their companies grow. Want to see the web page I created highlighting my trip? Can I tell you how I created that page? What if I told you that I created the page without a line of code? What if I told you I decided every aspect of the page without even tweaking any CSS code? You’d likely ask me how I pulled it off, right? And what if I told you that I could create any design I want? Or that I did this layout in less than 10 minutes? I find that speed is the way to compare so many different drag & drop pagebuilders for WordPress. When you try to compare specific features, you get an apples and oranges comparison. But when you compare on time, it’s pretty easy. Did it take you 5 minutes? 15 minutes? 55 minutes? After all, isn’t that what we care about? Did I mention the theme is free? Sometimes I move so quickly I forget to mention the important stuff. Yes, this theme, this drag and drop solution that doesn’t make things over-complicated and lets you get things done quickly is absolutely free. So this is how they give back to their community. Want to see the interface? It’s pretty nice. 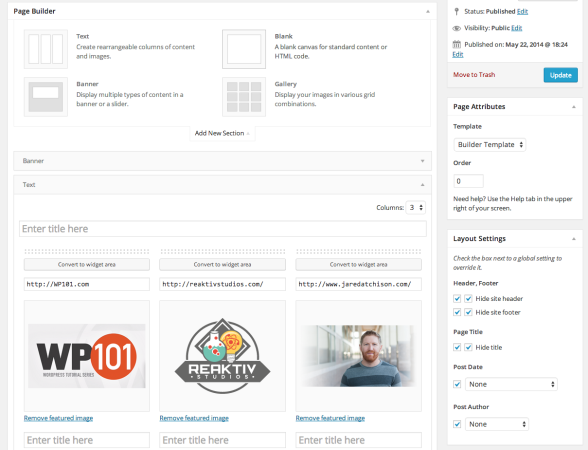 It makes it easy to create banners, columns of text and images, links, and more. It’s perfect for just about anything you want to make. Maybe that’s why they called it Make. Let’s score this drag and drop WordPress theme, so that you can compare it with some of the other options out there (when I release my 10 theme comparison, which is still in the works). It’s possible I didn’t figure out how to save a layout and use it for other pages. So if that’s the case, my final score would change. But as you can see, it did very well. The average score is a perfect 8 – which is not bad for a v.1 release. So go download Make right now. Did I mention it’s free? I would play with it more, but I won’t be in town this weekend. I’ll be at the Indy 500 with some friends.